The first thing our instructor asked us to do with our cameras was to identify the battery type and the memory card. I had already embarrassed myself by not knowing how to turn off my cell phone at the beginning of class as requested--in my defense, I have to tell you that I am a new and somewhat reluctant cell phone user. I got the darned phone turned off with some help (saw a classmate roll her eyes) and was immediately faced with another technological challenge. Battery? That wasn't so bad, as I had just charged up the battery in preparation for the class. And, what's this? They want me to buy a second battery in case the first one runs out in the middle of a shoot? Don't they know how much these things cost? Okay, I got over the shock at having to buy an extra battery ($42 and up) and then I had to deal with the memory card. I hadn't seen the thing since buying the camera, but found its little compartment and popped it out. Oops, it was a SanDisk compact flash card all right, but its memory was only 2 GB (only? what do these people want?). Right away, I had to add another item to my shopping list--a 4 GB compact flash card. Thank goodness I didn't shame myself by not bringing along a USB cable to download photos from the camera to the computer--one of my classmates had never downloaded anything from his camera in the two years he had owned it (!) and kept muttering to himself, buy an ABC cable, buy an ABC cable. I loved that man right away, he made me feel so much better about myself. 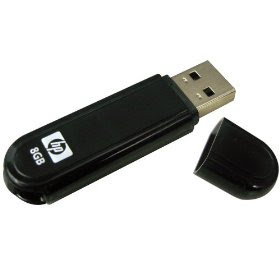 However, now there was one more item to add to my list--a flash drive (we used to call them thumb drives)--in order to save our edited photos and transport them between home and the classroom. The old one I had somewhere in a drawer at home was laughingly outdated, memory-wise--kind of like me. So, there was one more item to buy--an 8 GB flash drive. The good news is that I ordered all three items--the flash drive, the memory card, and the extra battery--from Amazon the next morning and had them all in time for the next week's class, even without paying extra for any kind of fancy shipping. Question: Which is the best camera for you? Answer: The camera you have! Our instructor's point was that most of us are not using all the features on our current camera and we can use the camera we own to learn a great deal about digital photography. 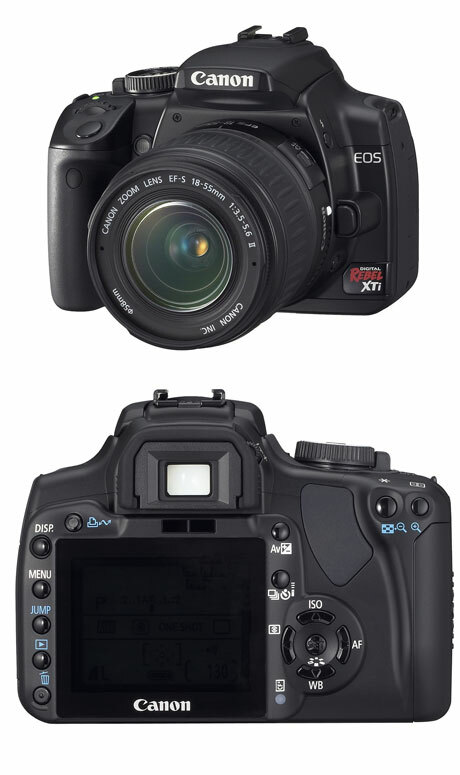 My single lens reflex camera is a Canon EOS Rebel XT, shown below. I chose it because I could use either automatic or manual mode, and because I could change from the lens that came with it to either a telephoto or wide angle lens. It can store a LOT of photos, depending on the quality image I choose. It will keep me busy learning about photography for years to come. It's a wonderful camera and I really love it, especially as I learn more and more about what I can do with it. The only drawback? It's a bit heavy to carry, especially when I am out bird watching and also carrying a pair of binoculars, or when I am riding my bike. And it was expensive to start with. 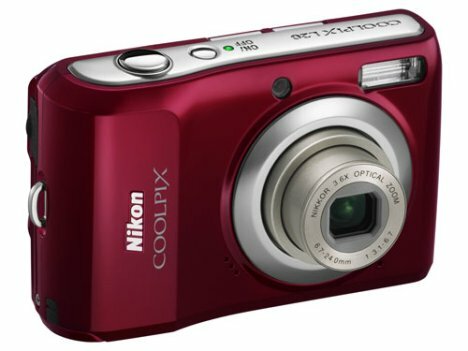 Our instructor suggested that for occasions when portability is an issue, I might consider getting a digital point and shoot camera like the one my sister has, shown below. It is small and lightweight, and easy to slip into a pocket wherever I might be heading. The lenses in these cameras are getting better and better, there is built-in optical image stabilization (vibration reduction), and the small cameras are becoming more affordable all the time. I realize that this is just a very superficial description of these two types of cameras. For more information, see this Consumer Reports guide to digital cameras. Here is another one of those days with strange lighting. The storm clouds are so low that they have completely hidden our mountains, usually visible from this side of the house. 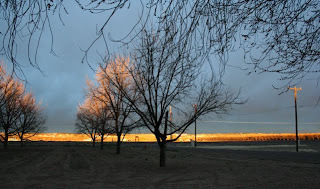 The setting sun has lit up the tops of the trees, while the rest of the orchard is dark. And the east mesa is struck with light, a little bit like the earlier shot I posted for Skywatch, below. In that shot, taken from the same patio on a different afternoon, you can see the missing mountains. For mountains and seascapes and prairies with their accompanying skies as seen all over the world, please visit Skywatch. It's Ada Lovelace Day, an international blogging celebration of women in the sciences and technology that is named for the person often considered to be the world's first computer programmer (see Wikipedia article). For my contribution to the celebration, I would like to recognize Sonja Gonzalez, who is currently Director of Technology for the Oyster River School District in New Hampshire. This district was recognized by Offspring magazine as one of the 100 top school districts in the U.S. When I worked with Sonja, we were in a much smaller and less recognized rural K-8 school in Fremont, New Hampshire. She was Director of Technology; I was the School Library Media Specialist. I want to tell you about what a difference Sonja made to the staff and students there. Sonja did what an ideal technology director should do--she kept up with the latest changes in her field and used whatever means she could to funnel those new technologies into our hands. As every teacher knows, having the technology (say, laptops for all of your students) is meaningless if you don't know what to do with it. Sonja taught us how to use equipment and software to make better learning experiences for our students. She led workshops, made learning opportunities available to us both on- and off-campus, and was a model user of technology herself. She tirelessly researched grants and wrote applications for funding, greatly expanding the possibilities in a school where money was always scarce. By the time she left, classrooms had computer workstations, access to portable laptop labs, and a greatly improved stationery computer lab. Every teacher knew how to use technology to enhance their teaching and simplify the record-keeping chores that take up so much time in a teacher's day. It was because of Sonja that I was able to "fly" a fourth grade class to Shibuya, Japan via Google Earth, as an introduction to a book set there (see The Librarian as Travel Agent). 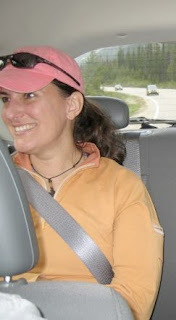 Sonja also introduced me to blogging, and here I am, 2 blogs and over 1200 posts later! (She also introduced quite a few of us staffers to the art of making sushi during a memorable how-to luncheon held in the library, but that is probably a story for another time). I would love to hear about women in science and technology who have made a difference in your life. Just leave a comment on this post. 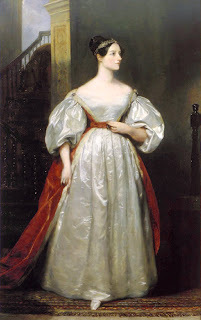 Read more about Ada Lovelace Day and find other bloggers taking part in the celebration. 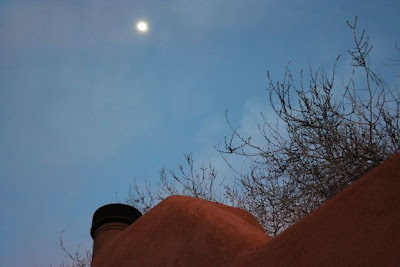 I've been spending a bit of time every day reading Andy Baird's blog, Travels with Andy. He tells about his experiences on the road as a full-time RVer, and how he discovered that he could retire at 55 and live very comfortably. Some years back, Andy learned in a retirement seminar that he wouldn't be able to even think about retiring until he had savings, pension, and Social Security income to equal 80-90% of his working salary, and he figured out that would mean having at least $800,000 in the bank. Discouraged, he formulated another approach--the "die at your desk" plan, which essentially meant that he would never be able to retire. To see how he got from that low point to being able to retire at age 55, you will have to read the website. Even if you aren't interested in becoming a full-time RVer (I'm not, although Andy makes it sound awfully good), you will still learn about culling your possessions, selling your home, living well on a reduced income, buying the best digital camera, taking wonderful photographs, traveling on a shoestring, which state has the best parks, designing space-saving storage, how Amazon.com's membership can pay off, all about buying a Mac (computer) and/or a new car for a rock bottom price (without raising your blood pressure or losing your dignity), and lots and lots of other wonderful things that keep me up reading about Andy's world late into the night. You'll also find that you can help support Andy's website by using this address (bookmark it to make it easy) each time you go to the Amazon.com page to place an order. It doesn't cost you anything, but Andy gets a few cents for each referral. If I haven't explained the process clearly, just go to Andy's Shameless Commerce page to read about how it works in Andy's own words. 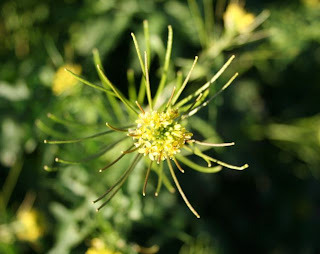 A friend who was visiting recently from Canada was very worried about the mustard weeds that have been springing up all around our fence lines and in a few other places. He knows a bit about introduced plant species and their consequences, and spent a lot of his time here trying to identify these weedy intruders in our yard. 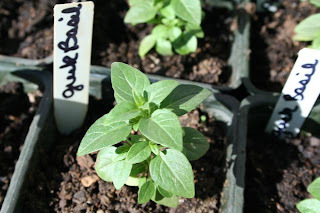 It turns out that they are possibly either Sahara Mustard or London Rocket, both of which are annuals propagating from seed. 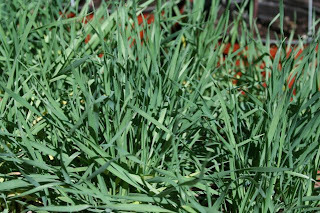 All we have to do to get them somewhat under control is to cut them off at the ground before the flowers go to seed. He was right to be concerned. 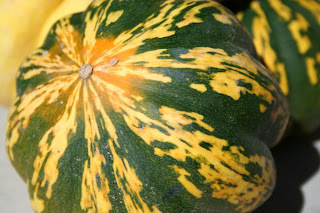 These plants host some pests that can make big problems for our local farmers. 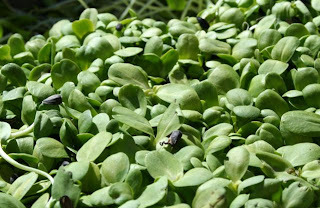 According to the Las Cruces Sun-News: ...the weeds harbor a pesky insect, known as the Beet Leaf Hopper, which in turn carries a virus. The virus, called Curly Top, can wipe out young chile fields. 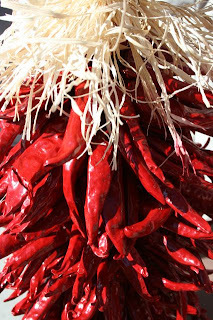 Oh, no, not our beloved chiles! 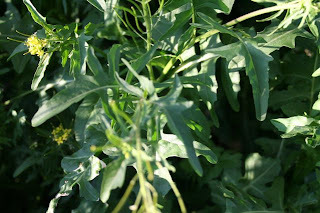 We'll be outside, hacking away at the few remaining weeds in the yard and disposing of them. I hope we can convince our neighbors to do so, especially the owner of the surrounding pecan orchards. His weeds are growing just on the other side of our fences, potentially making all of our efforts useless when those plants go to seed. 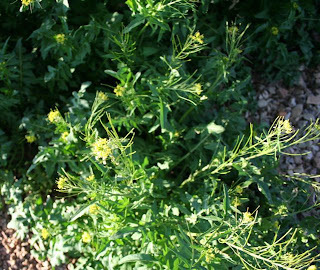 Within the city limits, code enforcement requires that property owners can be cited, fined, or even jailed if they don't remove the weeds within 24 hours of being notified by the city. I'm not sure how the problem is handled outside of city limits, where we live. I guess we'll just have to see what happens next. The Digital Photography class continues to be a tiny bit overwhelming. After all, whole books have been written on just single facets of this art/science, and we are cramming an awful lot of information into three classes and a field trip. I can tell you that one thing I have learned from the class that is already making my photos clearer is that there is a diopter/dioptric adjustment knob on the camera that will adjust the viewfinder image to suit my eyes, even without glasses. Now I have a much better chance at shooting sharp, focused photos. Who knew? Actually, it was right there in the owner's manual all along, of course! 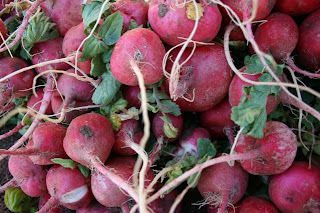 For the "taking photos of food" assignment, I visited the Farmer's Market and shot all morning. 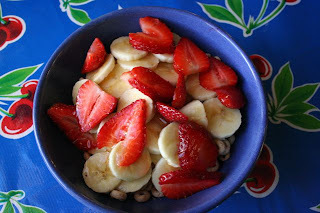 Then just this morning when I was slicing bananas and strawberries into my bowl of Cheerios, I was struck by the wonderful colors and ended up carrying my bowl from room to room and even outside, and shooting it in a variety of settings, with a flash and with natural light. Those Cheerios photos turned out to be my favorites. Here are the five photos I used for the assignment. All have had some slight corrections made with iPhoto (cropping, straightening, exposure and highlight adjustments), which we worked with in class. Be sure to check out Skywatch Friday for skies, both stormy and sunny, from all over the world. 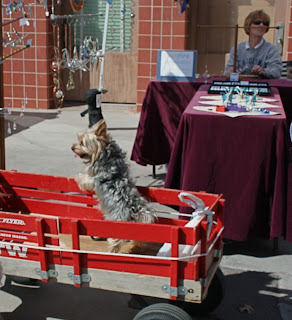 I've been showing you some photos from the Las Cruces Farmers Market over the last couple of days and I wanted to end the series with some dog photos. They were really taken as an afterthought last Saturday because I was mainly there to shoot food as part of a Digital Photography class assignment. Next time I think I'll find a better vantage point to shoot from--something low and stationery, so I can really do these doggy personalities justice. For now, here are some shots caught on the fly. 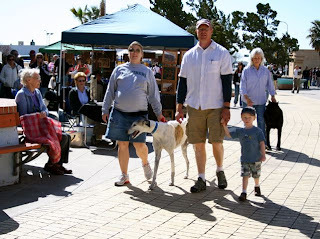 Some of the dogs at the market are there because they are available for adoption from the local shelter; this dog walker wears a sign that says "ask me about this dog"
Some dogs come dressed in their favorite outfits; some come sporting their best beards and mustaches! The homework assignment this week for my Digital Photography course was to take photos of food, so a stroll through the Las Cruces Farmers Market this past Saturday was just perfect. It's too bad that I didn't get photos of the green chile spring rolls that Beez is still talking about. 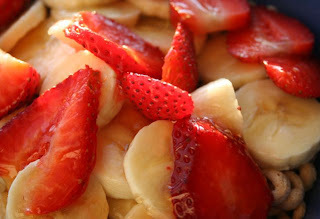 It will be interesting to see what we learn to do as far as editing our food photos. Be sure to click on any photo to enlarge it slightly. 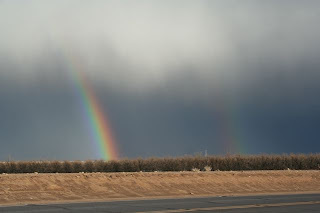 We are starting to have some really beautiful weather here in the high desert. Cool nights, as always, morphing into lovely warm, sunshine-filled days. Wearing layers of clothing is a must. 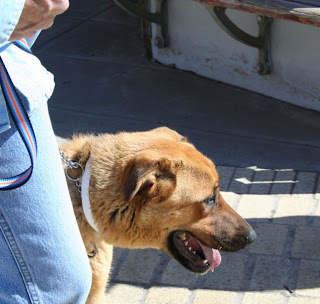 We might start out the morning on a bird walk or at the public market wearing a couple of shirts plus jackets, then we peel away the layers as we reach the warm afternoons. I'm setting up a backpack that will always be ready to grab on the way out the door. In addition to the camera, phone, binoculars, and maybe the Flip camcorder, now I have to remember extra water, sunscreen, sunglasses, and a foldable wide-brim hat. 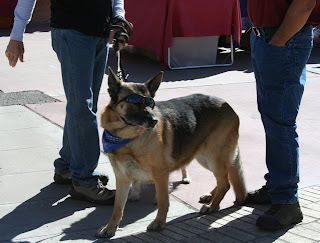 Got to be ready for all that New Mexico sunshine! The trees are leafing out, daffodils are in bloom everywhere, and the fruit trees are in bloom. The raptors are arriving down at the bosque. The farmers all around us have started field and orchard irrigation, and the Rio Grande is full from bank to bank--looking like a river at last. In other seasonal news, up at Dripping Springs the "animal sighting" board lists the first spotting of a diamondback rattlesnake, stretched out on a trail and soaking up the sunshine. We were up there at the Visitor's Center on Saturday afternoon, admiring the views of the city and mountains, and watching some search and rescue workers practice rock climbing rescues. I'm pleased to report that we didn't spot any snakes ourselves. 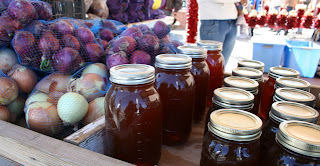 The Farmers Market is in full swing now on Saturday mornings. 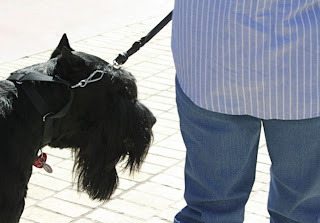 This past Saturday the place was full of hundreds and hundreds of people, many with their dogs. 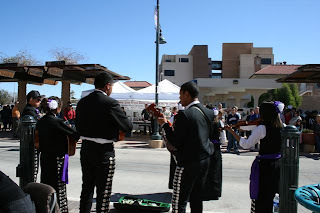 There were jesters and jugglers and mariachi bands and solo singers scattered everywhere. 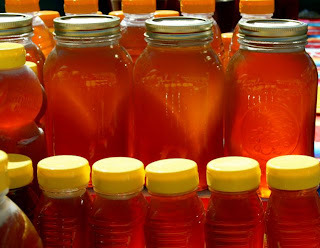 In addition to the crafts, jams, and jellies featured there all winter, we are now also seeing lots of bedding plants, herbs, fresh produce, and many kinds of honey. 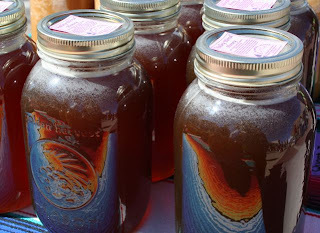 We bought some Desert Mesquite and some Red Chile honey (hot! 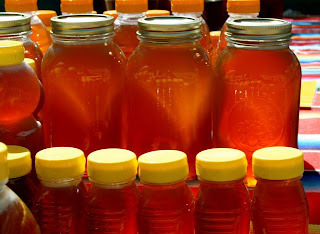 ), hoping that eating local honey will help with the allergies that are in full swing at our house just now. I got a lovely nasturtium plant for the patio, Beez bought (another!) 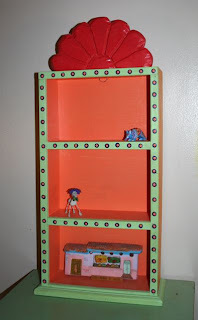 hand-tooled leather belt, and we finally got the perfect little cabinet from Mr. Bean. 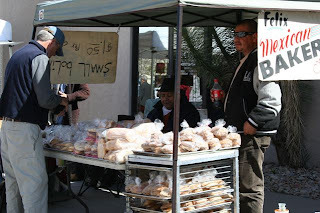 I'll have some more photos from the market in the days ahead. 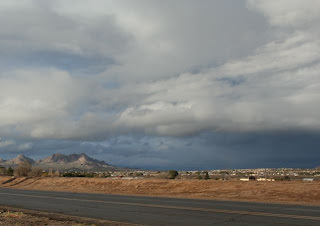 There's a certain time of day, after a bit of overcast, when the sun breaks through and the city of Las Cruces is lit up in a golden kind of light. It's even more lovely against the dark mountains and cloudy skies. I just started my new class in digital photography, and my head is spinning. Macro photos! Light sources! Flash! No flash! Batteries, cables, memory cards, lenses, downloading, editing, and on and on. I hope you'll be seeing an improvement in the quality of the photos posted here. I'm off to do some assignments. We've just discovered the Asombro Institute for Science Education near Las Cruces. 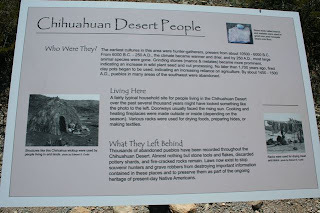 I liked the more descriptive former name, the Chihuahuan Desert Nature Park, but no matter what it is called it is still wonderful place to visit, especially if you are a fan of the desert and of endless views of the surrounding mountains. Located east of the city, the 935-acre park is near the Doña Ana Mountains and overlooks the Jornada Basin, with vistas that also include the San Andres, San Agustin, and Organ Mountain ranges. In high rainfall years, the runoff water from the entire basin accumulates in the emphemeral Isaacks Lake, forming a very shallow lake that quickly evaporates. Auntie Bucksnort and I got off to a fairly early start this morning, because we are working on getting ready for the coming desert heat of spring and summer, when we know we'll need to do our explorations either early or late in the day. The park is probably only a 20 minute drive from our house to the last turnoff, then a leisurely (but bumpy) additional six-mile drive down a dirt road. There is a parking lot, a shaded picnic table with an amazing view, and bathrooms at the trail head. 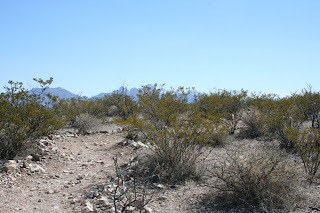 Near the parking lot is a xeriscaped memorial garden, a short "Desert Experience Mini-Trail," and the beginning of a longer (1.5 mile) Desert Discovery Trail. 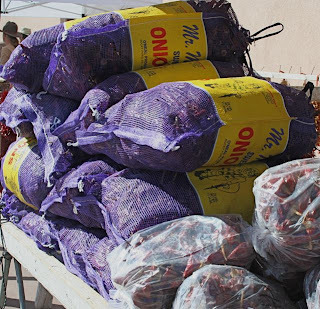 Everything is labeled along the way so that you can enjoy your self-guided tour of the Chihuahuan Desert. This was one of the quietest places I have ever experienced. Except for our own footsteps, the only other sounds we could hear were the wind through the creosote bushes and some happy little desert birds trilling in the distance. If you go: Wear long sleeves, sunscreen, and a hat to protect yourself from the sun. Take water, binoculars, and a camera. We thought that shady table by the parking lot would make a perfect place for a picnic. Hours and directions are here. "Asombro" is the Spanish word for “wonder,” which is exactly what Asombro Institute programs bring to the thousands of children and adults who participate each year. The Asombro Institute for Science Education (formerly the Chihuahuan Desert Nature Park) is a nonprofit 501(c)(3) organization dedicated to increasing scientific literacy by fostering an understanding of the Chihuahuan Desert. To achieve this mission, we currently serve more than 14,000 K-12 students and 2,500 adults in New Mexico and West Texas with inquiry-based science education programs each year. 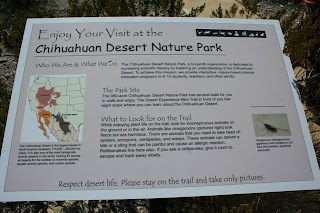 Programs take place in classrooms, schoolyards, and at the 935-acre Chihuahuan Desert Nature Park site located north of Las Cruces, New Mexico. A Dam in the Desert? To live in the desert is to be aware of water. That seems obvious--living in a dry place, you learn to carry water at all times, to keep yourself hydrated, and to landscape with native or drought tolerant plants so that you reduce or eliminate the need for watering your yard. 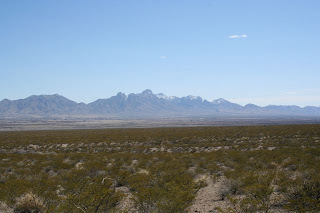 However, when we first arrived in Las Cruces, we were surprised to find a great big earthen dam paralleling the highway. A dam in the desert? A dam with no water? It's the Las Cruces Flood Control Dam and, as you can see from this cycling map (below), it is highlighted in red right next to Highway 25. Coming from a wetter climate, I am always interested to see that there are housing developments behind the dam--if this were a traditional dam like Hoover Dam, this is right where you would find Lake Mead. You soon learn this about living in a dry place that gets just 8 - 12 inches of rainfall annually: When the rain does come, it sometimes comes hard and fast, drains off the mountains and mesas down into the river valley, and might lead to flooding if not otherwise diverted. 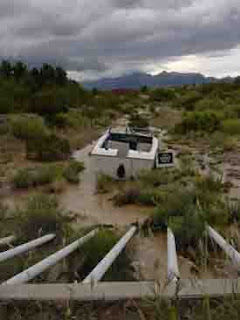 Back in the 1970s, the flood control dam was constructed. According to the City of Las Cruces Storm Water Management Design Standards, they are aiming for protection against a "100 year storm event." For moons and stars and skies and sunshine from everywhere, go to Skywatch Friday. This photo is totally unconnected to the following post. I've just put it here to buck us up until spring. 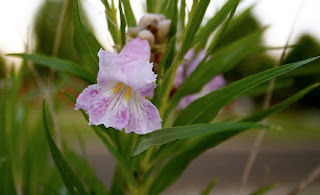 It's a close-up of a blossom on my desert willow tree back in Clovis. Some of you have mentioned, here or there in the comments, that you might be traveling through Las Cruces some time in the future. 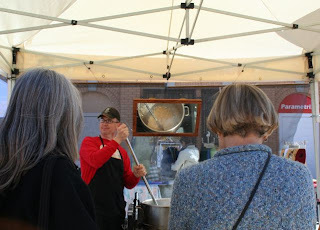 I could tell by the reaction to On the Trail of the Best Green Chile Cheeseburger on this blog the other day that there is some interest in hearing about good local restaurants. Hey, if there is a need out there, the Zees will make the big sacrifice and do a little restaurant reviewing from time to time. Someone's got to do it. 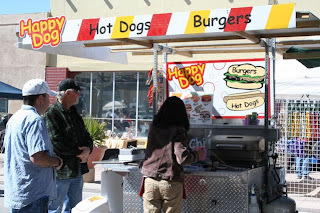 My husband, Beez, is always happy to try another green chile cheeseburger (he calls them GCCBs) and writes about them over on his blog, Pirate Dogs and Pilgrims. He is also very fond of pizza, and managed to eat two meals in one day this past weekend from the newly-opened and anxiously-awaited Zeffiro's New York Pizza (his review is here). I'm more of a breakfast person, and was pleased when we got an opportunity to try out the well-reviewed Old Mesilla Pastry Cafe/The Shed. For some reason it is known by both names, although I've mostly heard it called The Shed. It looks like there was once a separate bakery that was overtaken when the restaurant expanded, and lots of fresh-baked goods are for sale. It was a great place with wonderful food and really nice people. Auntie Bucksnort had the special--Eggs Benedict with salmon and fresh asparagus (such a huge salmon steak, she brought half of it home). Beez had migas (scrambled eggs with tortilla strips, cheese, peppers, onions, etc.). I had the oatmeal pancake because I had read some exclamatory reviews about it online. In honor of its deliciousness, I plan to post my version of oatmeal pancakes over on my recipe blog and will come back and post the link here in a day or so. Here you go--as promised: Oatmeal Pancakes. If you would like to read a little more about The Shed, you can check out some reviews on Yelp. When I was telling you about the star party a couple of weeks ago at Leasburg State Park (The Intrepid Naturalists Meet the Stars), I mentioned that thanks to a monk, we were able to observe the night skies through a type of telescope that we could learn to make ourselves. The telescope that was provided at the star party was a Dobsonian telescope, as invented by John Dobson. Dobson has been called one of the most influential figures in astronomy over the last fifty years because of his belief that everyone should be able to have access to the tools that make backyard astronomy possible. John Dobson earned a degree in chemistry from the University of California at Berkeley in 1943, and joined the Vedanta Monastery in San Francisco in 1944. As he became more and more interested in astronomy, he began to work on making his own telescopes from recycled materials such as discarded porthole glass, old hose reels, and the bottoms of gallon jugs. Once he had seen the wonders of the heavens through his scopes, he thought that everyone else needed the chance to see the same thing. And so he began his life in public astronomy, taking his telescope out onto street corners for all to look through; teaching classes in observation and telescope-making; and starting the public-service organization, The San Francisco Sidewalk Astronomers. To read more about his life, see The Sidewalk Astronomers. Here is a video of Dobson, talking about his life in public astronomy. 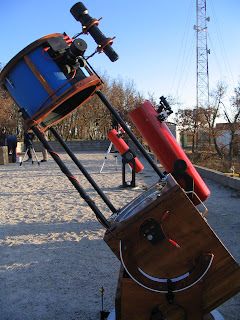 The Dobsonian telescope that we used at Leasburg was handmade by our star party host, Nils Allen. He belongs to The Astronomical Society of Las Cruces, which holds monthly informational meetings, as well as a couple of telescope-making workshops each year taught by Mr. Allen. There is contact information on this [somewhat-outdated] page. Even though the club hasn't been updating the workshop page, it will still get you in touch with the people who schedule the workshops.